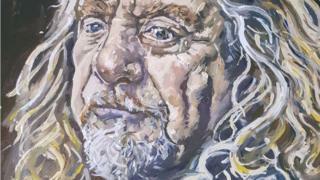 A thief has shown a "whole lotta love" for a portrait of Robert Plant by stealing it from a pub. The portrait of the Led Zeppelin legend was part of an exhibition last Friday at the Brown Lion pub in the Jewellery Quarter, Birmingham. But two days later, it was removed by someone who claimed to be part of the artists' group behind the exhibition at the pub, the artist said. Artist Chris Davies said he was both distraught and flattered by the theft. West Midlands Police have been informed and Mr Davies believes other works were also stolen. The painting of Plant took a month to complete said the 48 year old, of Sedgley, who is also a digital print technician. "The opening night went really well but then on the Sunday I got a phone call from the [arts] group leader to say she understood I had taken down my artwork and I said, 'I hadn't' - that's when we realised," he said. Plant himself has not commented on the theft, which left Mr Davies a bit "dazed and confused". A pub spokeswoman said she had advised the artists not to hang the works with just a nail and that the paintings needed security. Mr Davies has since shared an appeal on Twitter in the hope of getting the work back. "On the one hand I'm distraught", he said, "but on the other I'm almost flattered that someone has liked it so much to take it - though of course I would prefer if they had paid me for it!"